In West Virginia, teachers have ended their historic strike, after state officials agreed to raise the pay of all state workers by 5 percent. The strike began on February 22 and shut down every public school in the state. It was the longest teachers’ strike in West Virginia history. As West Virginia teachers celebrate victory in their historic strike, Oklahoma teachers are considering following in their footsteps. On Tuesday, the Oklahoma Education Association announced that teachers would go strike on April 23 if the state Legislature doesn’t approve pay increases and funding for educational needs. 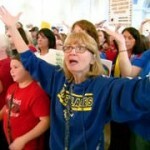 Teresa Danks is a third-grade teacher at Grimes Elementary School in Tulsa, Oklahoma. She made headlines last year when she panhandled on a roadside to raise money for supplies for her classroom. She has since started a foundation called Begging for Education, dedicated to funding classrooms, improving teachers’ salaries and fiscal responsibility in Oklahoma. On Tuesday, 16 Senate Democrats joined with 50 Republicans to advance a bill slated to roll back key financial regulations passed in the wake of the 2008 financial crisis. The bill would exempt 25 of the nation’s 40 largest banks from being subject to heightened scrutiny by the Federal Reserve. If it passes, it would be the biggest weakening of the Dodd-Frank Act since it was signed into law in 2010. The 67-32 vote in favor of a “motion to proceed” now sends the bill back to the floor for debate and possible amendments before a final vote in the coming days. This year’s midterm elections officially began on Tuesday as Democratic and Republican primaries were held in Texas. Democrats are hoping Texas could become a key state in the party’s effort to retake control of the Senate and the House. A record 50 women were on the ballot in what many are calling the “year of the women.” On Tuesday, Congressmember Beto O’Rourke won the Democratic primary for U.S. Senate. He will take on incumbent Ted Cruz, who easily won the Republican primary. On the House side, Democrats are putting up candidates in every Texas district for the first time in over 25 years. In one of the most watched Democratic races, progressive Democrat Laura Moser placed second, forcing a runoff against Democrat Lizzie Pannill Fletcher, an attorney who has been criticized for working at a law firm that has targeted unions in Texas. The race is seen as part of a war within the Democratic Party. Moser was endorsed by Our Revolution—the political organization that grew out of Bernie Sanders’s run for the White House. Fletcher was backed by the Democratic Party. In February, the Democratic Congressional Campaign Committee took the unusual step of directly attacking Moser even though she is a Democrat. Moser and Fletcher will now face each other in a runoff to decide who will face Republican Congressmember John Culberson in November.